PRICE: 149 INR for 50 sheets pack. In spite of using oil free/oil control make up, at some point or the other my face has to turn oily which just ruins my look .In order to keep my make up intact, a face blotting tissue is a must for me. So here is a review on the product I am currently using. 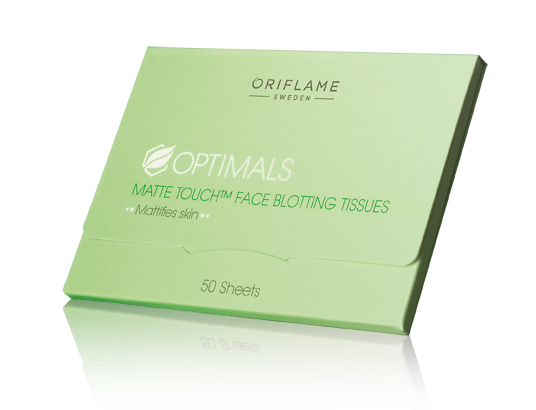 Oriflame blotting tissues come in a nice cute green coloured packaging. The inner cover of the pack has a sticker which enables you to pull out a sheet easily. When you open the pack you will find a sheet already attached to the sticker. No need of manually picking out one (refer to the pictures above). The tissues/sheets are green in colour with no fragrance whatsoever. It absorbs oil nicely without affecting my make up. It is true to its claims of mattifying. But the matte effect is temporary and my face turns oily in an hour or so and I have to reach out again for a tissue. Another drawback is that the size of the blotting tissue is too small. I need at least two to blot off oil from my face. It did not irritate my skin in any way. I wish the pack had more sheets, at least 100. This one will finish off soon. I'm not sure whether the price is worth it. Overall, I would say this product is okay. But you can choose to skip this one. 1. Cute travel friendly packaging. 3. Does not affect make up. 1. Need more than one tissue/sheet at a time. 2. Less quantity for the price. I would rate this product 3/5. I have bought these blotting tissues recently and I liked them. It instantly absorbs all the oil from my face without affecting my makeup. I always carry them in my purse while going out. Yeah Neha, these are really good. I only wish the quantity was more for that price.